The New Year is quickly approaching and Awards Season is going to follow. TODAY’s hosts are already looking forward to the Golden Globes and that’s because this year, they want to take one lucky viewer with them to the party! 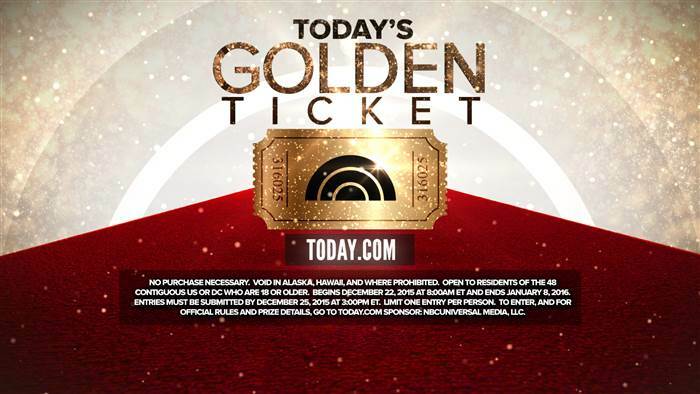 So they launched a special contest, and it’s called “TODAY’s Golden Ticket“. All you have to do is go to Today.com, post a picture that shows you are a huge Golden Globes fan and tell the reasons why they should pick you as the winner. TODAY’s will be flying you and a friend to the entertainment capital of the world – Los Angeles, California – for a Golden Weekend where you”re going to stay at the Sofitel Los Angeles at Beverly Hills. Plus, you’ll dine at the fancy Sofitel’s Esterel French Restaurant, you’ll get a hair and makeup makeover at the Sofitel Spa, you’ll get a $500 shopping spree at the Beverly Center, and more. It’s going to be great. But wait, there’s more! You’ll also have your turn at the Red Carpet and receive exclusive tickets to the Golden Globes Official viewing party. A grand prize valued at over $3,000. All entries must be completed and received by no later than 3:00PM ET on December 25, 2015 to be eligible. Open only to permanent, legal U.S. residents who are physically residing in one (1) of the forty-eight (48) continental United States or the District of Columbia (excluding Alaska, Hawaii, Puerto Rico, Guam, the Virgin Islands and other United States territories), and who are eighteen (18) years of age or older as of the start of the Contest Period.